Prof Meredith Temple-Smith from the Department of General Practice, Assoc Prof Jane Tomnay from the Department of Rural Health and their PhD student Nicole Iturrieta Guaita were welcomed by two Chilean Universities. Meredith, Jane and Nicole participated in the 1st Research Conference organised by the School of Midwifery and Childcare, Universidad de Valparaiso, as part of the 10thanniversary activities "An International Perspective on Sexual and Reproductive Health". Meredith spoke on Sexual Health and Aging, Perspective and Education: the SHAPE project; Jane talked about Improving Access to Medical Termination of Pregnancy in Victoria. Universidad de Valparaiso Prof Paulina López shared the results of her research Map of Prematurity in Chile, and Nicole, who is also an academic of the School, presented the preliminary results of her investigation Partner Notification for syphilis in Chile. A busy program of meetings and workshops including the Campus Director and professors from the School, offered the chance to exchange academic experiences as well as exploring future research collaboration between the universities. The Melbourne trio visited the Faculty of Medicine at Viña del Mar Campus and met with senior academics from the Faculty of Medicine Secretariat and the School of Midwifery and Childcare, as well as local professors from the School. 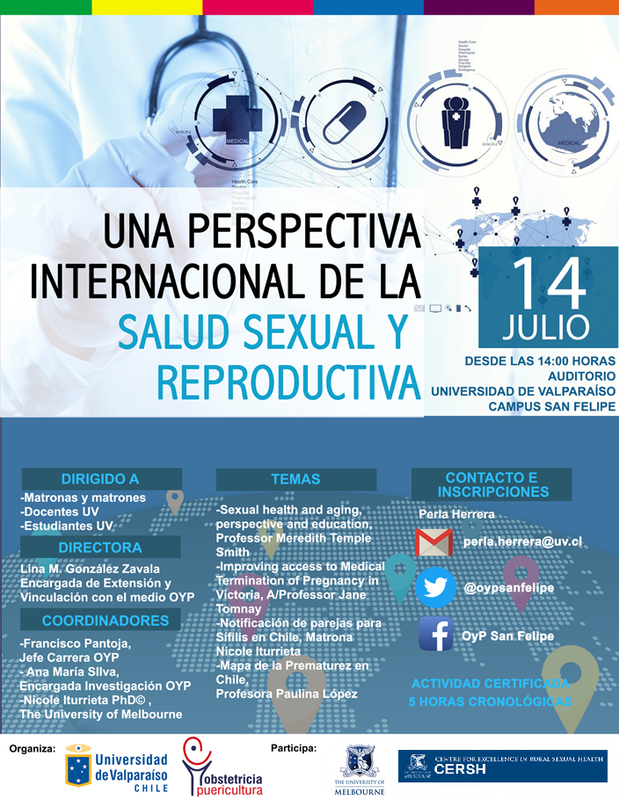 They also visited the Pontificia Universidad Catolica de Chile in Santiago, participating in a workshop organised to present the SHAPE project and to share experiences from both countries about sexual health teaching as well as potential common research interests for developing future collaboration.